Corinne’s big sister, Astrid, has always looked out for her, even if Astrid believes Corinne has favor with their parents. Astrid has a secret. She confides to her younger sister her plans to leave the tiny town of Cherbourg, France, to become the first colored fashion designer in New York City. She’ll finally be on her own and rid of the family’s strict rules. When their father loses his job, Astrid is commanded to leave school in order to assist the family financially. Trying to help, Corinne reveals Astrid’s secret but only makes the situation worse. Astrid feels betrayed by her younger sister and promises revenge. She seizes the perfect opportunity with Corinne’s blossoming friendship with a boy from class. The sisters become mortal enemies and vow to hate one another until the day they die. That day may come sooner than they think. On April 10, 1912, the family boards the beautiful Titanic on a voyage that will change their lives forever. “A Bond Broken” is the prequel novella to “Unsinkable”, which tells the fictitious story of the only black family on the doomed ship, the Titanic. 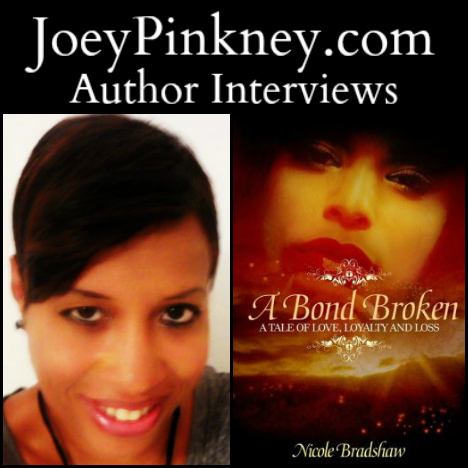 Joey Pinkney: Where did you get the inspiration to write “A Bond Broken”? Margo Myles is over 40 and giving birth to twins. But she doesn’t know who the father is – her soon to be ex-husband, Jefferson, or one-time fling, Malik Mason. Malik is running for a political office and unbeknownst to Margo and Jefferson, Malik is also getting ready to marry their daughter. Scandal and politics seem to make perfect bedfellows as evidenced by the bizarre triangle mother and daughter find themselves – fueled by Malik’s desire to possess political power, an heir and a woman to call his own. Joey Pinkney: Where did you get the inspiration to write “In My Rearview Mirror”? Setrina “Mimi” Bailey is carrying a nineteen-year-old secret that she’d like to remain hidden forever. She was raped by Victor Christianson, her best friend Brenda’s fiance. Mimi makes a desperate attempt to protect her secret when an event she’s unable to control brings her back to the town and the scene of the crime. Joey Pinkney: Where did you get the inspiration to write Betrayed?